Most fans agree that Doctor Who's Weeping Angels are one of the scariest and creepiest villains the Doctor has faced. 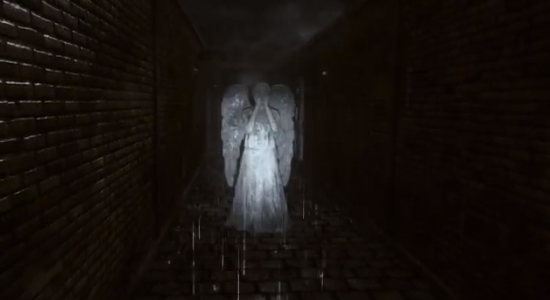 YouTuber John Smith created this CGI short film called "Stone" showing a flight through a menacing maze with the Weeping Angels in hot pursuit. After over 300 hours of rendering, it's finally done! This is my first ever CG short film. It's the culmination of about three months of work, from initial concept to final result. I had to use every single trick and technique I knew, as well as learn countless more. The programs used were Mudbox, Maya, After Effects, and Premiere. Oh, if you haven't seen the show, the Weeping Angels are a predatory "quantum-locked" alien species. Whenever anything looks at them, they appear to be stone statues. When no one is looking, they can move lightning fast. So...don't blink. Nice ending. At first I feel like I'm playing Castle Wolfenstein, till you run into the first Angel. Looks like you guys will need to update this again; Man-Thing can now be officially said to be back with Marvel, since Agents of SHIELD have specifically mentioned him by name (and Ellen Brandt was used in Iron Man 3). Also, I think Hulk is part-owned by Universal. Thanks for pointing this out Andy. It’s important to note that this infographic refers to the movie rights. The television rights for some characters are under separate contracts. So while Agents of S.H.I.E.L.D. ties into the movies it has a different set of rules. This may be the first hint that the rights have fallen back to Marvel though. I’ll do the research and see if it warrants an update. Thanks! Who does Disney own? Can that be included in the next update of this infographic? I'm trying to find what exactly they own. Also, who owns Dazzler?? Dazzler is owned by 20th Century Fox last I heard, so I’ll add her when I update the graphic. Good question Addie! I should say they own the rights to everything Marvel owns Addie. Just to avoid confusion.